After the mame-maki is over, everyone eats the same number of beans as their own age. It is believed that by doing so, people will be free of sickness during that year. Mame-maki began as a New Year ceremony (in the traditional Japanese calendar) to drive out evil spirits and the seeds of misfortune, as well as to pray for the family’s well-being and good business. 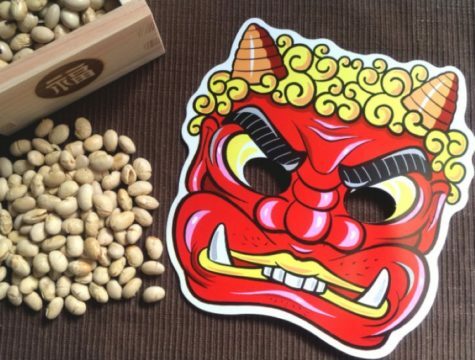 In the Heian era, a famous Buddhist monk was said to have driven away Oni (demons or evil spirits) by throwing beans. Oni masks are popular. Oni are mountain ogres with horns; fangs; red, blue, brown or black skin; and carry weapons. Families with little children especially look forward to this day because mame-maki can be a lot of fun. One person acts as the goblin and runs around, while the others throw beans at the person. At some schools, the students make goblin masks and enjoy mame-maki. At Buddhist temples and Shinto shrines all over the country, there are celebrations. 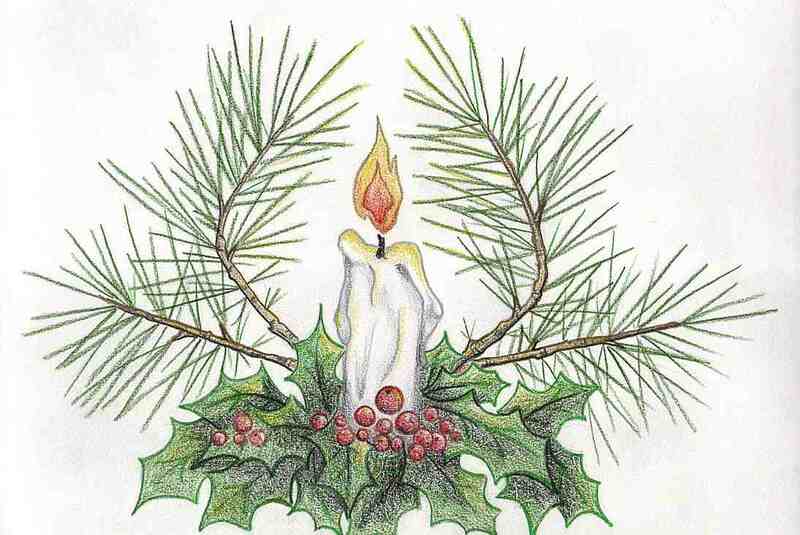 Priests and invited guests will throw roasted soy beans (some wrapped in gold or silver foil), small envelopes with money, sweets, candies, and other prizes for people to catch. Some families put up hiiragi iwashi (holly sardine), small decorations made from cooked sardine heads (sometimes the whole fish) stuck onto holly branches. They are placed on the entrance to the home so that bad spirits may not enter. A traditional food is Eho Maki, a sushi roll made with seven “lucky” ingredients. Though sushi rolls are usually sliced into bite-sized pieces, Eho Maki is not, as slicing it would cut off good fortune. A wish is made, then the roll is eaten in silence while facing the year’s lucky compass direction. The direction changes each year. Ginger sake is a customary drink. This Japanese goddess embodies the first snow, where she glistens and shines with incomparable beauty until she freely and joyfully gives herself to spring’s warmth and melts away. By so doing, Shirata reminds us that while the year has only just begun, the wheel of time is ever moving, and that we should make the most of every moment. For happiness, cut a snowflake pattern out of a quartered piece of white paper and carry it with you in your wallet as a charm. Make sure to visualize the snowflake being filled with brilliant white light, like that which is seen when the sun shines off new-fallen snow. 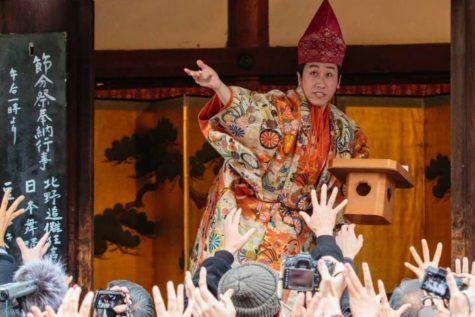 In Japan, this day (Setsubun) is a time to chase away any malevolent influences that might hinder Shirata’s joyful nature within us. People scatter beans and make loud noises to banish evil and carve lanterns with wishes to light the way for a better tomorrow. For our purposes, scatter seeds on the ground or plant beans instead so something as beautiful as Shirata can replace any negativity in your life with abundant growth. To internalize Shirata’s happiness, prepare any white beans and eat them as part of a meal today. If you hold any rituals, use beans to mark the magic circle, scattering them counterclockwise to banish any unwanted influences.